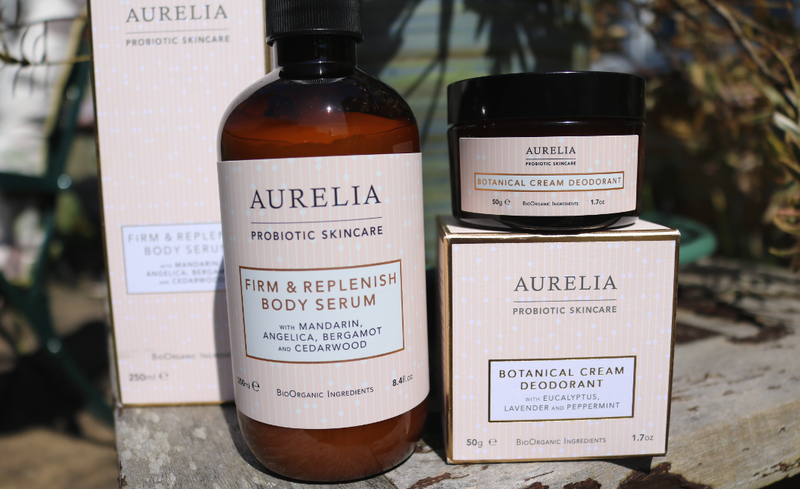 Aurelia are well known for their probiotic-infused skincare, and are a firm favourite amongst beauty editors, skincare gurus and green beauty lovers alike. Having been introduced to their incredible Eye Revitalising Duo (which I featured in my Hayfever post here) recently, I was very keen to try out some of their much-loved body care products, so I've been testing these two in my bathroom for the past couple of weeks. As I have dry skin, I tend to use some kind of body moisturiser every day, and especially after baths and showers. My bathroom cupboard is full of body lotions, butters and balms, but this is perhaps the first time that I've had the pleasure of trying out a body serum. 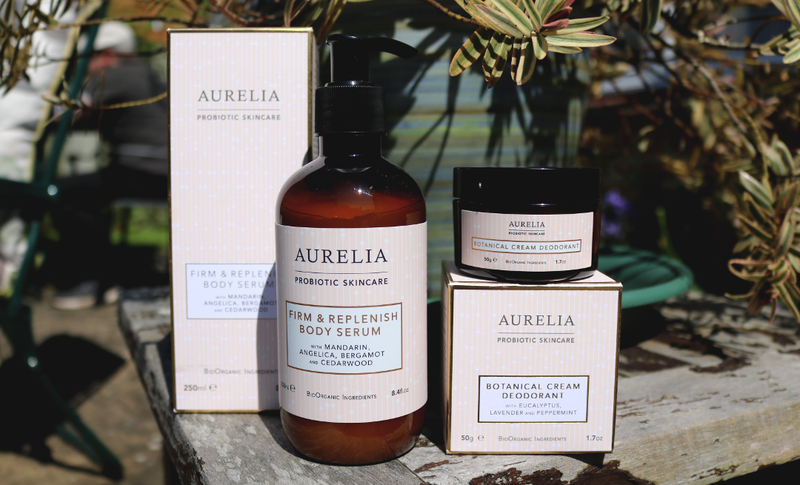 Suitable for all skin types, including sensitive, Aurelia's Firm & Replenish Body Serum is a brilliant luxury product to use if you're showing a bit (or a lot!) of skin this Summer as it's rich in antioxidants and helps to smooth out and firm up the skin's texture. The formula contains some of my favourite ingredients, including Shea and Cocoa Butters, Argan Oil, and Aurelia's signature African botanicals, Baobab and Kigelia, and it has a beautiful spa-like, fresh and clean scent thanks to a blend of steam-distilled essential oils (Mandarin, Angelica Root, Lemongrass, Chamomile, Bergamot and Cedarwood). Texture-wise, it's very lightweight and is somewhere between a lotion and a serum in consistency. It sinks in quickly, but leaves a bit of tackiness if you apply too much, so I'd recommend taking your time by using smaller amounts and layering them for a more pampering experience. My skin feels instantly soothed and nourished whenever I use this, and it's also lovely to use as an aftersun product. I've been using natural deodorants for a couple of years now and I find that the ones which work the best for me often have a cream-to-powder texture, which perfectly sums up this Botanical Cream Deodorant. Having won numerous awards, I was keen to put it to the test over this recent hot spell we've been having in the UK and so far, it's been holding up incredibly well. This deodorant is aluminium and parabens free and includes only natural ingredients such as Corn Starch, Shea Butter, Arrowroot, Lavender, Vitamin E, Kaolin, Tea Tree, Peppermint, Orange Peel Oil, Bergamot, Eucalyptus, Rosehip Oil and Jojoba Seed Oil. The ingredients all have their own unique functions such as Arrowroot and Kaolin, which help to keep dry absorb perspiration throughout the day, Shea Butter to moisturise and soothe the delicate underarm area, and essential oils to provide antibacterial properties and a fresh scent to keep you smelling good. It comes packaged in a luxe glass jar and you only need to apply a small amount directly to your underarms, so 50g of product will last longer than you might expect! This is one that I'd definitely recommend if you're on the hunt for a gentle, but effective natural deodorant. Have you tried anything from Aurelia?